Beat Latino celebrates in every hour a different facet of the extraordinary diversity of the Latin & Latino musical universe – from traditional, roots music to the most cutting-edge avant garde, Beat Latino shares the best of our music with you! Presented in Spanish and English so that those who enjoy the music will also enjoy the information, Beat Latino airs Fridays at 1PM and Sundays at 11am on Vocalo, a Chicago Public Media initiative, as well as Saturdays in Berlin and is archived on this website weekly. Beat Latino specials are also licensed all over the United States through the Public Radio Exchange. 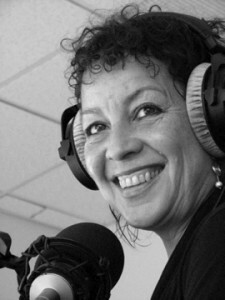 Catalina Maria Johnson, the host and producer of Beat Latino writes a monthly column on music for Revista Contratiempo, and contributes regularly to Wall Street International Magazine in English and in Spanish, Gozamos, 848 and Worldview on WBEZ (Chicago Public Radio) and Latin Roots on NPR’s World Cafe. Follow Catalina on twitter, too! Many thanks to Beat Latino’s collaborators, whose assistance makes the show possible. Roberto García edits the shows. Paulina Olivares Neumann is Beat Latino’s Website and Social Media Coordinator. Adam Akbani, Camille Bacon, Joshua Nagel, Darius Patrick, Benjamin Rodriguez-Johnson and Teresa Rodriguez-Johnson assist with website research and production.